I now have two Sinkevich ZT's, the 0456 and 0470. I was amazed to have them side by side, as their OAL is almost exactly the same, and yet they could not be more different in design, looks and feel. The 0456 feels chunky, stout and hand filling, the 0470 feels refined, classy and almost, dare I say this about a ZT, delicate. I have to say I am really digging Sinkevich designed knives and ZT does a wonderful Sinkevich flipper. I just hope ZT does a sprint run of 450's and 452's in 20cv. Last edited by Fah; 15-04-2019 at 10:21. I like the 460/462 though they won't find their way into my collection, the 460 is in s35vn and no lanyard hole, 462 no lanyard hole, so deal breakers for me. I do really like the looks of the 456CF but I just can't justify buying it. Billboarding is a contentious issue, ZT seems to really like to festoon their products with writing, in most cases I dislike it and the 470 is a lot cleaner than most ZT's as they omit the billboarding on the pocket clip which is a step in the right direction IMO. I am right there as far as M390, 20CV, 204P is concerned, my favorite and prefered blade steel for folders. As far as sprint runs of 0450 and 0452 go I would be surprised if there are any more. I managed to grab one of the 0452 with the CF and blue anno in M390. While the knife is very well made (as you would expect from ZT) But it is not something I would ever carry. The 0452 is just that little bit large and has a definite air of menace about it. While the 0450 is just that little bit too small. So the ergonomics just don’t seam to fit. Sorry if that seamed a little bitchy but the knife I would have liked to have seen would have been a 0451... sized somewhere in the middle. From memory there were also sprint runs of the 0450 in ZDP 189 (I wish 8 bought one of these) and there was possibly a M390 one as well. There was also another sprint run of the 0452 in full Ti not sure of the blade steel but think it was M390 again. 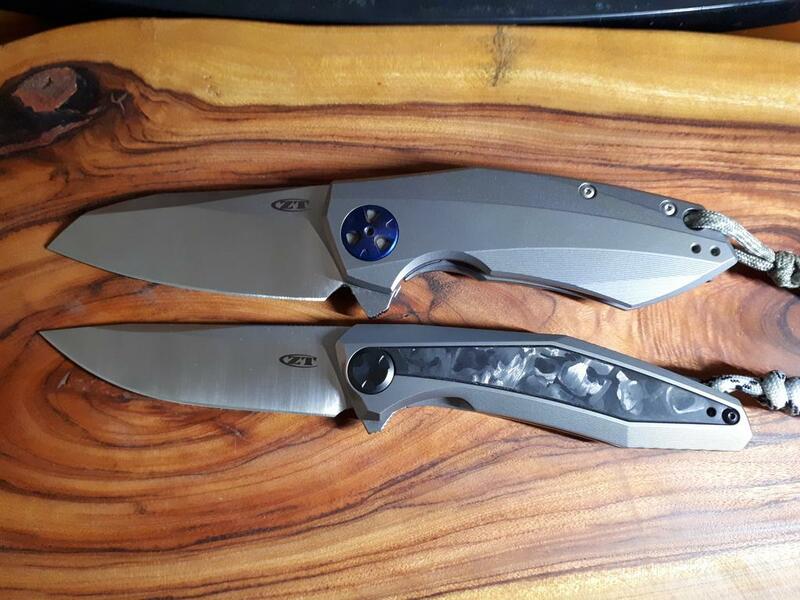 Sinkevich does a fantastic job of his designs and ZT truely does do them justice. The 0470 looks like a very functional knife. Possibly there best design of 2018. I am very interested to see if they do some sprint runs or limited editions as there is a lot of potential there. Before I vanish back into the either I’ll wade into the blade steel debate. M390, 20CV and 204P are all great blade stocks and do exactly what there designed for. For a knife going into the collection that will only ever relieve light use I would go with one of them any day. But for something getting worked a lot more I would go for S35VN in a user knife any without a second thought. It has been much easier (for me) to maintain a workable edge with short regular sharpening sessions. M390 almost requires specialised gear or the patience of a saint to resurrect a dead edge. I saw the 450 in zdp189, but they were over $500 each so a bit too expensive for my tastes (I have a comfortable spend limit of $500 for knives) and wasn't collecting when the other sprint runs you mention were available Scott. I totally agree with your assessments of both the 450 and 452 concerning sizing/carriability. I have large hands and the 450 does feel too small for me. Concerning steels, I only ever use folding knives for light cutting duties and honestly don't do a whole heap of cutting with my EDC day-to-day, so I never have to reprofile or resurrect an edge and a light retouch with the SharpMaker and a good stropping is all I ever have to do, so M390 (20cv, 204p) perfectly serves my needs. Still, even if I had to do a whole heap of cutting each day I would probably still go with an M390 (20cv, 204p) folder, I simply love the stuff and don't really find it much harder to sharpen. All times are GMT +10. The time now is 21:33.